From the 5th to 8th of February 2018 the group of young researchers from Ukraine visited the University of Göttingen within the framework of the project “Conditions for the functioning of the 3rd branch of government”. This project is a result of further development of long-standing cooperation between the Juridical Faculty, German Law Center of the National Taras Shevchenko-University of Kyiv and the Institute of Public Law of the Göttingen University (see the previous Issue of this Newsletter for more information) and is funded by the Alexander von Humboldt Foundation. 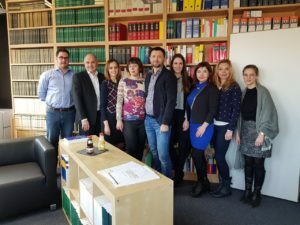 During this visit the Ukrainian researchers were introduced to the principle of independence in the German judicial system by the judges from Göttingen administrative court and had an opportunity to observe the real-life civil proceedings in the court. They also established research tandems with German partners based on a range of topics of joint interest. Currently all the participants are working on the respective papers to be compiled together as co-authored chapters of a joint publication, and are looking forward to the future joint workshops and meetings. The participants were also grateful to their German colleagues for an excellently designed cultural program that included a city tour, visit to the historical university building and an excursion to the beautiful surroundings of Göttingen.